In this category you will find pram liners and snuggle bags to fit iCandy Apple 2 Pear, Peach, Blossom (= Peach with double seat, Pear and Strawberry 2. With narrower upper part and contoured seat section, they slide nicely into the seat and offer three levels for the shoulder straps. 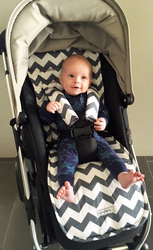 iCandy prams harness is very easy to unclip so you can fit your new Pramskins liners in a couple of minutes. The liners and/or snuggle bags will provide extra padding for comfort and make your iCandy look stylish and cool at all times.